This application is a basic Windows debugger engine core which can debug the application running under windows 32 bits platform. 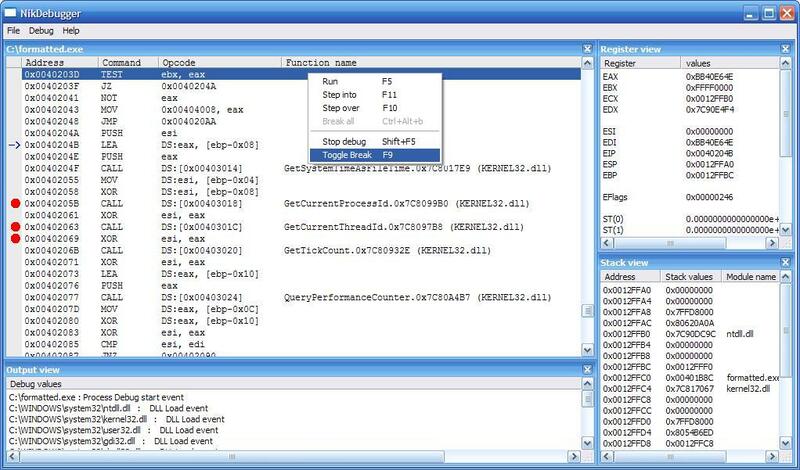 NikDebugger provides the basic debugging features to the windows developer to find bugs and troubleshoot their applications. Its a simple but effective application which has small executable size (130Kb when zipped i.e. easily downloadable). Shows assembly code view (intel x86 32-bits family processors disassembly), register view and stack view apart from application debug output. Small size (just 130 KBytes when zip) and no need to install or un-install just unzip and run. Its supports basic debugging commands like single step, step over, run and break. Its shows debugged application disassembly code, registers and memory stack views. User can put or remove the breakpoint by simply clicking on the side disassembly view bar. All breakpoint are software driven breakpoints and also its shows debug events in a output view. Its shows import function and module names along with the application disassembly code. If application has it pdb file around its automatically shows source function names.